Home Tags Posts tagged with "Winter Holidays"
Let’s face it, this time of year can be a little depressing. The days are getting shorter and temperatures are dropping. However, there’s one sure fire way to boost your mood and that’s to book a winter holiday. If you’re looking to arrange a vacation with a difference this chilly season, the following guide should give you all the inspiration you need. One option is to jet off to the Caribbean. In this sun-soaked holiday spot, you’re guaranteed great weather. For an active break in this tourist favourite, test your skills scuba diving in the warm oceans. As long as you have suitable insurance in place from a firm like Dive Master, you can make the most of the incredible dive sites that dot these idyllic islands. Whether you’re a novice or a pro, you’ll find suitable sites to explore. For example, the shores off Grenada are home to the wreck of the cruise ship, the Bianca C. This submerged vessel consistently ranks among the top wreck dive sites in the world. Another tourist favourite is the Underwater Sculpture Park at Moliniere Bay. This attraction features a series of impressive aquatic installations that are based on local history and folklore. One of the artworks depicts 36 children being slowly turned into coral. You can free dive and snorkel around the park too. Bonaire is also renowned for its top-class scuba spots. The island is surrounded by a marine park that boasts an abundance of underwater life. Yet another magnet for divers in the Caribbean is Grand Cayman. It features over 200 dive sites in total, including Stingray City. For an unforgettable experience, you can also plunge beneath the waves after sunset on a night dive off the coast of this island. If you’d rather pack snowshoes that swimwear when you’re preparing for your winter sojourn, why not head to Sweden for a taste of Sami culture? The Sami are an indigenous people with their own fascinating culture, language and customs. Their lands, which span across parts of Sweden, Norway, Finland and Russia, are particularly breathtaking during the colder months. A great place to get to grips with the Sami and their surroundings is Kiruna, Sweden’s most northerly town. The Sami have a history in the area dating back at least six millennia. You can book special culture trips there that include lessons in lassoing, sledging and snowmobiling. You’ll also see how central reindeer are to the Sami’s way of life. Another chilly but thrilling vacation option at this time of year is to go ice fishing in Lithuania. There are plenty of fish to be caught in the waters of this beautiful country. You can test your luck catching the likes of pike, perch and burbot. A hip flask of vodka is almost mandatory when you’re trying to reel in a slippery creature from the deep in this Baltic location. You’ll need the warmth to keep you going in the sub-zero temperatures. 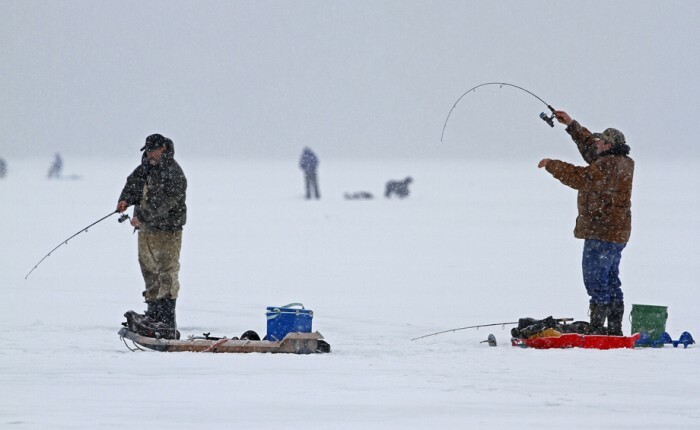 If you land a fish, you’ll see it freeze within 10 seconds of leaving the water. You’ll also get to see your catch prepared and cooked right in front of you. No winter vacation in Lithuania is complete without a traditional sauna. If you’re feeling brave, you can follow this with a roll in the snow. It’s also possible to arrange night fishing adventures. Just make sure you wrap up extra warm if you plan to brave the elements after sundown. These are just three of the fabulous winter holiday options on offer. With a little imagination and a web connection, you should be able to find the ideal vacation for you.